Used 1957 Porsche 356 Sold in Merriam KS 66203 Kansas City Autosport Inc. This is the only 356a coupe replica available in the world. I have sold three and this is the last one. Here is your chance to purchase one of the nicest 356a coupe replica kits you will ever see. I have done numerous builds over the years and I am extremely impressed with this one. The car I have for sale is just like the one on the pallet on the trailer. It is in a completely enclosed shipping crate. The car with the tires and wheels is the one I am building. It is not for sale. Its only pictured as an example of what your car can look like. Very solid hand laid fiberglass body. Stainless steel chassis. A-arm front suspension. Doors hung. Hood and engine cover installed with latches and seals. Front and rear bumpers. Rear window, rear quarter windows. Electric window regulators installed. Front disc brakes and calipers. Steering column. Door handles with keys. Manufacturer Statement of Origin 1957 PORCH. You can tell how straight it is from the pictures. Doors, trunk and engine covers fit perfectly. The hood has a full fiberglass liner and painted to match the exterior. Engine cover has a liner that closely matches an original 356. The stainless chassis is a work of art. Rectangular main frame with tubular supports that are all stainless. Bumpers bolt to the chassis not the body. The chassis is very strong and rigid. Floors are stainless with a boxed tunnel resembling the original. Front suspension is a custom A-arm with heim joints using Geo Metro brake components and set up for a Geo steering rack. Rack is not included. Chassis has a square tube support for high mount pedals. It also supports the steering column and door hinges. Body is bonded to the chassis. This car was built to be electric and have a battery tray in the engine compartment. I am building one and removed the tray and welded in a Volkswagen beam. I have supplied pictures of mine in the building process. It is not for sale. Pictures are for reference only. I am using a Subaru engine. Another option for the rear suspension is using a swingaxle and utilizing the existing trailing arm mounts and using coil over shocks to the existing shock mounts. The pictures in the trunk show the separate sealed compartment that will be used for A/C and electronics in mine. Needs interior, instruments, rear suspension, lights, wiring harness, steering rack, brake lines, pedals, rear brakes, tires, wheels, lights, door windows, motor and transaxle to complete the build. The dash will need to be filled for Porsche style instruments. 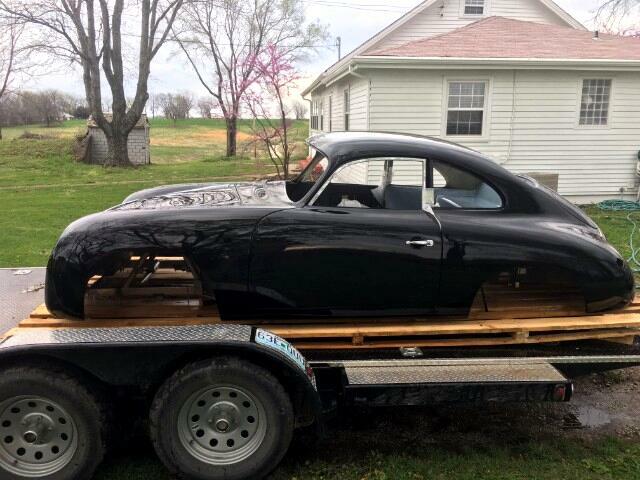 I had been looking for a while for the best Porsche Coupe to build. I acquired these in my search and have decided to dedicate my time to just building one. Here is your opportunity to buy a very high quality replica. I have done hours of research figuring out what suspension, tire and wheel combination to use to give it the proper look and stance. I will share my information that I have learned to make it easier for you. Please call me with any questions. Message: Thought you might be interested in this 1957 Porsche 356.